Like Winnie-the-Pooh who suddenly feels his gloomy days are over after meeting with adult Christopher Robin, so does my weeks of whirlwind problems concerning romance and job, my future life, to summarize it into a much simpler term. Like Madeline, Robin’s only daughter, who feels so much relieved in her heart after knowing his father won’t put her in a boarding (Pooh says it as “boring”) school, so does my heart as the movie concludes. No sorrow, bleakness left in my chest despite the tearful scenes here and there, in spite of the dark comedy I was afraid of potentially creating another “hole in the heart” as I commonly feel after watching Adam Sandler’s films. I prepared myself that I would watch a dark, depressed movie given the thriller of the movie some weeks before that Sunday afternoon going solo to a nearby cinema in Blok M area, southern side of Jakarta. On the back of my mind, I would see another mid-life crisis one, which would suit me best given my current age and all problems happening in my life. It was going to be a “normal-life” film, Eny, so bear it. Thank God, I was wrong, so much wrong, that I didn’t mind spending quite much money for paying ojek fee, snacks inside the theater then eating special dinner for myself. Because that movie turns out to be very sweet, even Pooh’s most favorite honey is inferior to the joy of the film. Again, thank God, I forgot that Winnie-the-Pooh is always an enduring children classic literature, that no matter how “normal” Robin is with bills to pay, mouths to be fed, the classic is for kids, or for family to watch together. 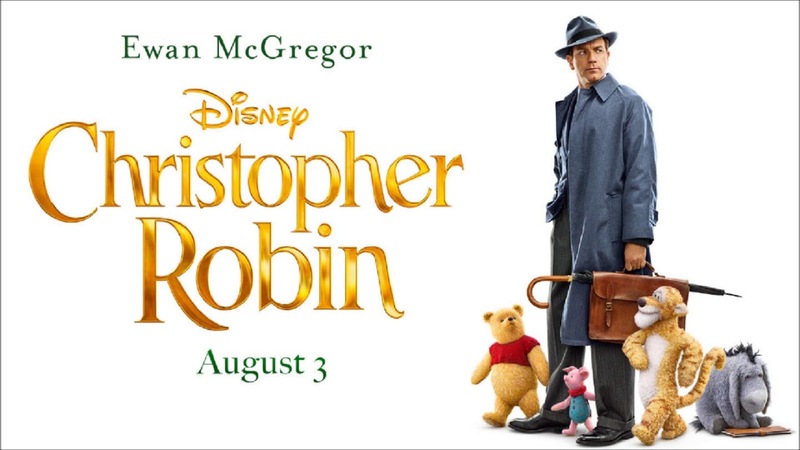 Christopher Robin (Ewan McGregor) plays the grown-up Robin, a 30 something man who works days and nights to make ends meet, provides best education for Madeline, like common married men do. He seems to have lost all the happiness he shares with Pooh and friends at Hundred Acre Woods after he receives the news of his father death when he is a teenager. All his life after that is filled with works, study because he is now the breadwinner of the family. He battles in the Second World War not long after he marries Evelyn. His post war trauma coupled with cost efficiency job at the company he works at makes him hardly to smile again. In the middle of his confusion, the long-lost friend comes, which is no other than Pooh. Unlike Pooh who is very glad to reunite with Robin, the protagonist doesn’t really care with the presence of the toy that used to entertain him when he was a boy. So every time Pooh acts silly, murmurs words for mere game play, Robin is disturbed because he has works to do. So much so that Robin takes Pooh back in the Woods, which is behind the cottage where his wife and his daughter spend a weekend before Maddy goes into the boarding school. This movie touches me deeper than I thought. I think that is because of the very strong traits each and every figure in the classic has. Pooh’s simple way of thinking becomes my most favorite of the film because his words get me thinking the hardest. For instance, he says, “They say, impossible is nothing. But I do nothing every day.” Or “Sometimes doing nothing can lead you to a great something”. His silly questions, like “Why is he in the cage” referring to a train ticket-selling man”. Or, “Is your suitcase is more important than your daughter?”. You know, the kinds of questions asked by your kids or nephews or cousins regarding your adult life that somehow make you evaluate your own life then. When Robin or us, as adults, have gone far, far away in life, say when you are 30s or 40s then things get tough, tougher than you imagined, we may like Robin. Burying our minds in the problems that we face that we forget we need to take a break. Taking vacation doesn’t mean going somewhere Instagrammable but as Robin here experiences, he unexpectedly revisits his past, very happy past time, to remind himself that no matter what happens, best friends are always there waiting for him to return. And that is the finale note that I take back home with me. I need to take a vacation just like Robin. What and how? I will share my vacation with you, my friends. Here.